Duke Douglas is an agent with American Intelligence. Exactly which department he works for might be up in the air. At one point he reports to a big-wig in the Secret Service and does call him 'chief'. Another time he reports to another leader working out of the Pentagon. He is loaned at least once to the FBI for a mission and another time, the initial meeting we have of him, he is loaned out to the government of India by the Secretary of some unspecified cabinet office. Whoever he answers to, and it is possible that since the adventures told of take place over a couple of years in the late 40s and early 50s it might have been more than one bureau, he has been around for quite a while and engaged in a good number of missions. We know that he got his start in the early days of WWII when he joined the Army (almost certainly as an officer since he was a college graduate) and was immediately assigned to the Intelligence (G2) branch. As the recorded adventures begin, he is likely in his mid to late 30s. This is based on his statement that he was a last year medical student when he joined Army Intelligence in 1942. That would have him probably 25 at the time he moved from the stethoscope to the cloak and dagger, 12 years before the series starts. Douglas speaks and reads Urdu like a native. Other languages he is an expert with include German, Russian, and Spanish as evidenced by his ability to operate as citizens inside those regions without being noticed. Some of these he would have been trained in during the War. The others would have come later. There may be others we do not learn of. He is an excellent shot, very dangerous in hand-to-hand combat, and knows which end of the knife to hold in a duel. He is also a skilled pilot and unafraid to take chances in the air or on the ground (shown by a willingness to land a small plane in the Alps). A quite good looking blond haired man (maybe with a tint of red in it), Douglas is attracted to the ladies and they are most definitely drawn to him. He probably has sworn off long term relationships, though because of the incident with the beautiful and deadly LLyanya Davany, a Soviet agent he worked with during WWII when Russia was an ally and he was ordered to cooperate. He did more than get along and fell in love. When some intelligence he foolish passed to her ended up with her bosses and gave Stalin an advantage in negotiations with the other Allies, he knew she had betrayed him and the relationship ended. A decade later when running into her on an assignment, the old feelings returned as did the distrust. Douglas' areas of expertise are impressive. Europe, the Indian subcontinent, the Middle East, and Central and South America are places he has and can walk with confidence and know he has a chance of survival, a chance people who challenge him are in short supply of. Found in Danger Comics #9 - 1-page text story - Duke Douglas needed help proving an industrialist was selling contraband to the enemy. Found in Danger Comics #10 - 1-page text story - The apparent suicide of a man Duke Douglas often worked with did not set well with Douglas but he needed a bit of trickery to catch the real killer. Found in Danger Comics #11 - 1-page text story - This may or may not be a Douglas story although I believe it is. The hero (Douglas) was on a golfing vacation when a call from a friend caused him to leave early. The friend was already dead of an apparent heart attack but things were not so cut and dry. 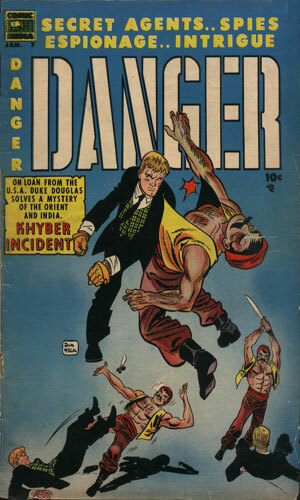 There were several comics published with the name of Danger, not counting a couple that had Danger in their name (like Danger Is Their Business). The earliest I found was by Allen Hardy Associates under the imprint of Comic Media Publications. The first five issues, Jan-Sep in 1953, had the subtitle of "Men Without Fear" and were anthologies with different non-series characters in different genres, all putting the hero into awesome situations almost certain to cause their demise. Issue #6 was also an anthology but the subtitle changed to "Secret Agents.. Spies Espionage.. Intrigue". It was in issue #7 that the first recurring characters appeared and both were agents. Duke Douglas and Virgil Stagg both saw their initial stories told in this magazine. The latter would have just one story in that issue and one each in #9 and #11. Douglas, though, would be in issues #7-#11 and have a couple of adventures in several of them. Comic Media went out of business at this point and sold to Charlton Comics the rights to its titles. Charlton continued the Danger line with #12 but it would only last only 3 issues, none of which had any recurring character. One other company had a line of comics with the Danger title - Super Comics had a short run of 9 issues but no recurring characters and definitely no Duke Douglas. The actual creator of the Duke Douglas character is not known from what I can see. The artist for the first story as well as the first cover is Don Heck but the follow-up Douglas story in that issue is credited to Pete Morisi. Heck did most of the artwork for the brief series run. Writing attribution is sketchy. Only one story has a writer listed, that being the third Douglas story (found in Danger #8) scripted by Ken Fitch. The terrific comic authority site, Jerry Bail's Who's Who, has Fitch down as the writer for several stories. I have chosen to credit both Heck and Fitch as creators but that is speculation more than fact. 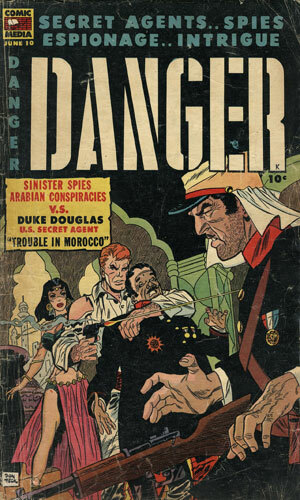 Danger Comics #7 - Duke Douglas is loaned by the US to India to help put down a jihad in the Khyber Pass, fomented by the Russians. Danger Comics #7 - The agent in Czechoslovakia needed help getting out of the country after being betrayed. Duke Douglas is the man to do it but then word comes that the wife the man was coming home to in Paris was the traitor. Danger Comics #8 - Soviet counterfeiters are smuggling fake plates and money. Duke Douglas has been on their trail and ready to nab them when their plane arrives but they pull a switch, causing Douglas to head into danger. Danger Comics #8 - Sent to Moscow, Duke Douglas is supposed to rescue a female agent and, if he can, assassinate Josef Stalin. Danger Comics #9 - The US wants an oil contract with a nation in the Middle East but others want it stopped so Duke Douglas is sent to get the signature. 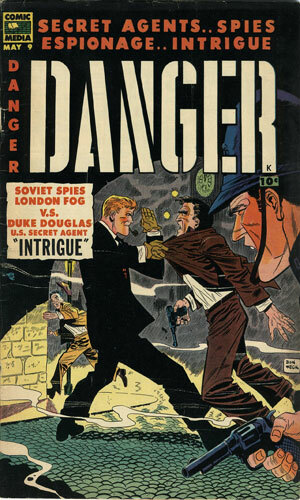 Danger Comics #9 - In London, Duke Douglas is asked to impersonate a Soviet spy to ferret out fellow agents in the U.K. Danger Comics #10 - The assignment in Morocco is to find out who is causing the unrest that threatens the region. He learns that a French outpost there is loaded with communists. 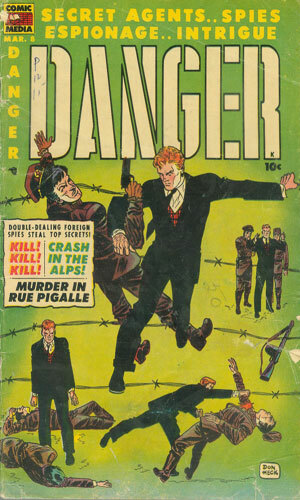 Danger Comics #10 - A wanted spy is dead and the search called off. Duke Douglas is not convinced and wants to stop him before the agent escapes the country. 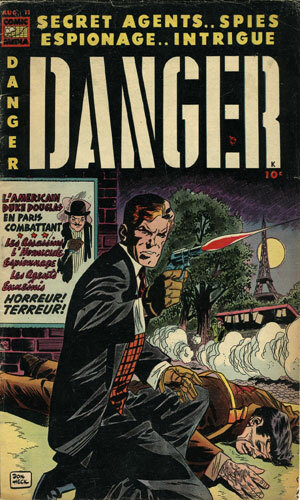 Danger Comics #11 - The French diplomat does not appear to be just that and Duke Douglas is determined to find out what else is going on. I am quite impressed with the Duke Douglas stories. They were created in the first half of the 1950s at a time when the worry about the Soviets was especially high across the nation. At the same time, the confidence that Americans felt in most everything they did was growing. These comics capture that feeling. The agents of the communist spy machines were everywhere with the MVD (precursor to the KGB) leading the assault and intrepid American operatives had to go to those same places to combat the threat. Douglas was often the man for the job. Some of the stories were 7 pages long and could add a bit of background or round out the story a bit more than the 5-page adventures but the use of the space in both was impressive. I got the feeling that I had been told a story when I finished each one, not just had images and dialogue thrown at me. Many of the spy comics from the 40s and 50s left me sorry they had tried. Douglas left me sorry there had not been more, especially a full issue tale.